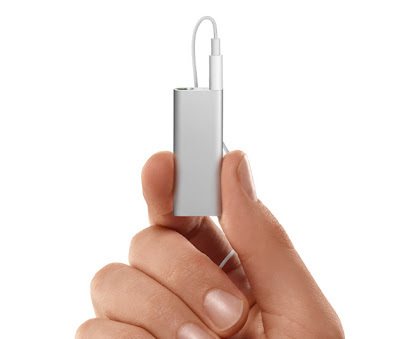 Apple surprised many today by unveiling a redesigned iPod Shuffle. The new design gets a memory spec bump to 4GB for $80.00. The new design (seen below) has no screen but Apple did include a new VoiceOver feature. VoiceOver allows "[w]ith the press of a button, it tells you what song is playing and who's performing it. It can even tell you the names of your play lists, giving you a new way to navigate your music". 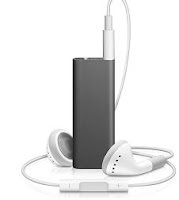 The new unit is on sale now in steel gray or charcoal colors and comes with the usual Apple accessories. Apple generally unveils new products on Tuesday but with this unveiling maybe Apple is trying to keep its followers on their toes.